THE SETTLEMENT, Anegada, VI – Some residents of the Virgin Islands, especially in the Ninth District, are said to be sitting very uncomfortable with what they said is an attempt by the National Democratic Party (NDP) government, in particular the Minister for Natural Resources and Labour Dr The Hon Kedrick D. Pickering, to allegedly “sell out” and dis-enfranchise fishermen on Anegada and Virgin Gorda. It must be established that this document has been circulating throughout the territory over the past two weeks and when it reached the hands of this news site early yesterday June 5, 2015 valiant efforts were made to reach Dr Pickering for a comment but were futile. Permanent Secretary in the Ministry of Natural Resources and Labour Mr Ronald F. Smith-Berkeley was also unreachable. The document seeks to amend the Fisheries Act No 4 of 1997. “That is another attempt to have us blindfolded and kill us the local fishermen, that amendment is again an attempt to suppress the poor fishermen and people and empower the rich and famous, the rich white friends,” alleged a Mr Vanterpool of Anegada. Notwithstanding anything to the contrary in this Act, Regulations or Orders mad thereunder, Cabinet may on the advice of the Minister and after consultation with the Chief Conservation and Fisheries Officer, grant a permit under this section to a person who wishes to carry out a development on an area declared under this Act, Regulation or Order made thereunder, as a fishing priority area, a protected area or a marine reserve. Cabinet may not grant a permit under this section except were Cabinet is satisfied that the development to be authorised is consistent with the overall objects of this Act, Regulations and Orders made thereafter and shall grant the permit subject to such terms and conditions as Cabinet may consider appropriate. 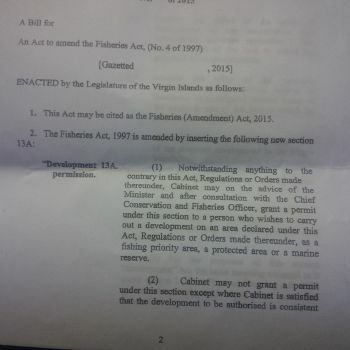 Without limiting subsection (2), Cabinet shall, in considering an application for a permit under this section, A. consider the effect of the proposed development on a fishing priority area, a protected area and a marine reserve declared under this Act, Regulation or Orders made thereunder in the locality or region in which the proposed development is intended to be carried out. B. consider the effect of the proposed development on any conservation and management measures applicable to the whole or part of the land to which the proposed development relates. C. consider the effect of the proposed development on the critical habitat of threatened or endangered species found on the whole or part of the land to which the proposed development relates. D. take into account the economic significance of the proposed development to the Virgin Islands. E. take into account any other issues as Cabinet may determine. An application for a permit under this section shall be made to the Cabinet Secretary in such form and containing such information as may be prescribed. For the purpose of this section ‘Development’ has the same meaning assigned to it under section 2 of the Physical Planning Act, 2004 and includes development taking place on sea and the sea-bed. For the purpose of this section ‘sea’ and ‘sea-bed’ respectively have the same meaning assigned to them under section 2 of the Physical Planning Act, 2004. For the removal of doubt, nothing contained in this section shall be read as exempting a person from the provisions of the Physical Planning Act, 2004 with respect to the granting of development permission under that Act. He said he did recall hearing the Minister, Hon Pickering, making mention of it in the House of Assembly, though he couldn’t recall a date, that they were looking at the possibility of designating certain areas as fishery protected areas. This prompted a loud outburst from one in the audience, “no way”. “On the onset, it may seem that there is some merit to what the Minister was saying but when you cut away all the chase and get to the real meat of the matter, what you come to realise quickly is that the area they have envisioned to do that is only giving certain protection to certain developers and that is frightening, very frightening,” Hon Christopher had stated. He said it is his view the legislation can stay the way it is and not be amended as he said, like the residents, it is being recommend for the benefit of their (NDP) ‘good rich friends’ and for this “the NDP should not be allowed to return to power”. Why would you want to build in a protected area anyway? if it is protected, you shouldn't be allowed to build if the law was followed. But we know that NDP is flexible when money is involved. This proposed amendment to the "Fisheries and protected Areas" is a big deal. It seems that some of us don't understand what's involved. We need to get rid of our biases and open our minds to other possibilities. the Ministers of lands/water rights/seabed rights/fisheries/fishing grounds/beaches "rich white friends", is Prickly Pear island, located just outside of the Gun Creek dock/harbour. It is also located smack between Necker and Mosquito Islands and Brand has been eying it for quite sometime. Charles T***s has also ben eying it also and even approached the previous administration about leasing it. In the opinion of many, especially fishermen, the proposed amendment to the fisheries Act is to enable the Ndp to turn over Prickly Pear island to Richard Branson and his "rich white friends". Why would the Done Deal doctor refuse, (over his dead body , he swears), to renew the lease of the local investors, (already there), who have invested in the Sand Box for these past several years, creating jobs and paying into our tax and social security system?. It is understood that when the owner of the Sand Box, (a tourism business, providing services to yachtsmen and the smaller cruise ships), asked the min****r about how they will get their investment money back, the man told her, "you have already made your money". 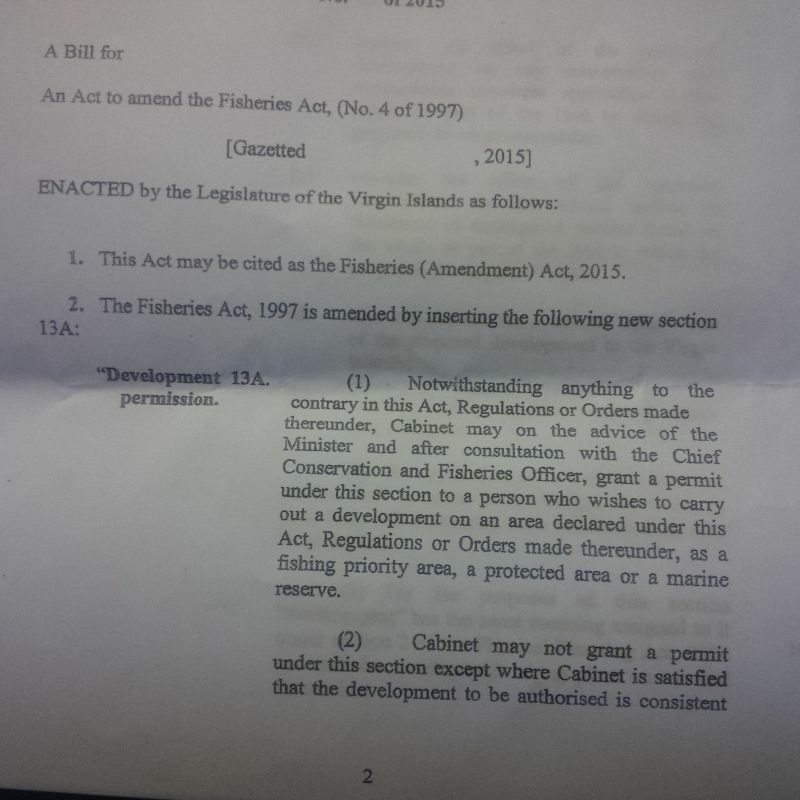 This document can wipe out the Fishing Industry in the BVI... This legislation is to ensure that the Beef Island development that threatened to destroy 90% of the fish in the territory cannot be stopped in the future. (THIS IS UNREAL!) Madness!!! Is this where money and power takes us people? exactly. The fish nurseries in the mangroves of Hans Creek supply 80-90% of the fish for the region. The proposed development would include a golf course which runs off into the creek and pollutes. This has always been part of the master plan development around the extended airport and proposed resort. BTW- who wants to vacation under a runway with larger more noisy airplanes? Pickering talks out of both sides of his mouth. LAND AFFECTS MARINE PRESERVATION. It is not a separate thing. DUH. And there was another book. More pages to follow. This is why the lady from Manchester is backing Myron as the next Premier when the Doc. steps down. You simply cannot trust him. Pickering needs TO GO...and Go he WILL!!! Let him go and socialize with his rich white friends he insulted us about! Trust me, this is the doings of the ENTIRE party. When certain people have you in their pockets, you must give them what they want. That is the price of favours. NDP MUST go. WE KNOW THAT MONEY THEY UP AND DOWN SHARING TO PEOPLE IS NOT THEIRS, WELL UNLESS IT IS KICKBACKS FROM CONTRACTORS MONEY. THERE MUST HAVE BEEN PROMISES MADE FOR ALL THAT MONEY THEY HAVE TO GIVE OUT. IS THIS FISHERIES ACT ONE OF THOSE DEALS, IS THE AIRPORT ANOTHER DEAL? WHAT OTHER DEALS DO YOU HAVE IN YOUR BACK POCKETS? AH BOY TIME WILL TELL. A man without respect for his own is homeless. How can he even bring about such a contentious piece of legislation when he has not consulted with the people it will affect most? there are so many loop holes a truck can be driven through. The cabinet, after talking to the minister (and CFD who is weak at fighting), can dictate permits for development which includes potential landfill and pilings. Doesn't matter if it is protected or not. A development can't be authorized unless the Cabinet says it is satisfied with the development is following protocol of the planning act (how often does Planning care about the environment?). The Planning act doesn't have tough enough provisions to support any fisheries protected areas. And As we know, the Cabinet has overridden basic stop-work orders by TCPD let alone planning on foolish projects for cronies. The Cabinet doesn't seem to have to follow the rules. It makes them up as they go along because they have ultimate control over regulations. This is a sham document allowing for more coastal fill for resorts and developments while jeopardizing mangroves and areas for fish. And THAT, in the long run, will kill the fishing industry. As and "environmentalist", Pickering sure doesn't know how nature works. GET HIM OUT! Dictatorship at its best or make that worst. Ayo see wha going on here, this man doing all he dirty wok in the 9th district so you see my people voters of the 9th .. they want this district bad the red party. So wha ayo think gonna happen if we put burtie in there. Lawd help us.. Do not vote for the red party...vote green or independent. keep away from the red. Please 9th District if we want to keep O'Neal out of here GO Green. Despite how good many of our independents are they are not going to pull through. This is what NDP is banking on. GO GREEN!. Take heed. The Fisheries Protected area is nothing new. It is a management tool. The Fisheries Act requires that you have permission to fish. The Fisheries Act allows for Orders and Regulations. The matter was discussed on Anegada several times by several Ministers of Natural Resources and Labour, also with Fisherman through the BVI. The Fisherman wants certain restrictions but still want to do what they want. This is not about rich friends. This is about good resource management - as one Chief Conservation Officer like to say - As the Environment goes so goes the BVI. Don't be misled, the BVI started on a path to Proper Environmental Management since 1959. This is good for the BVI, it has nothing to do with rich friends and it is good for our fisherman. It has EVERYTHING to do with "rich white friends". This piece of legislation is not just about Beef Island as some seem to believe. Have a really good look Eustacia Sound and the adjacent area. This was never a fisheries protected area but it soon will be if certain people get their way. Now ask yourself, "why". Go get yourself a copy of the fisheries protected areas and a copy of the new "suggested" fisheries protected areas. Study all of them closely and then ask yourself why. The geography is rather obvious. Who owns the land and the smaller islands nearby. What developments are being considered and where? We are not fools. Information is critical. People need to be aware of what is going on BEFORE the election. 'They wish to amend (change) the Act'. It was this Act that gave grounds for the courts to stop the Beef Island Development that would have caused great harm to BVI's fishing industry a few years back. That is why the voters in the 3rd District must vote for Fraser who can be the next Premier and not O.J who is going to be a back bench-er. When people in positions of power begin to feel like they know more than the people they serve the become disillusioned about what is wrong and what is right. This is Pickering's way to give prickly pear nattional park to branson? I do not want to hear nothing from the opposition you all sat down and id not ask Kedrick one question in three and a half years now you all talking p1ss. Alvin you did not ask one question in three years you all are shameful you all just aint the answer for this country either. You are blogging piddle. The Opposition has been asking about a lot of things over the past three and a half years and we are still waiting on the answers. Mark aryo it is not all young people stupid. We have a future here to protect and we are going to do just that. This draft has nothing to do with rich friends... absolutely nothing. The government is interested in preserving areas. Ayo ain't gon learn till u have nothing. A set of poppy shows on these blogs . Poor Anegada will pay the price. Vg will have all the natural beauty and yall will have none because YOU WOULDN'T LISTEN. Keep up the ignorance! And before you seek to understand you just want to point fingers pitying ndp against vip.